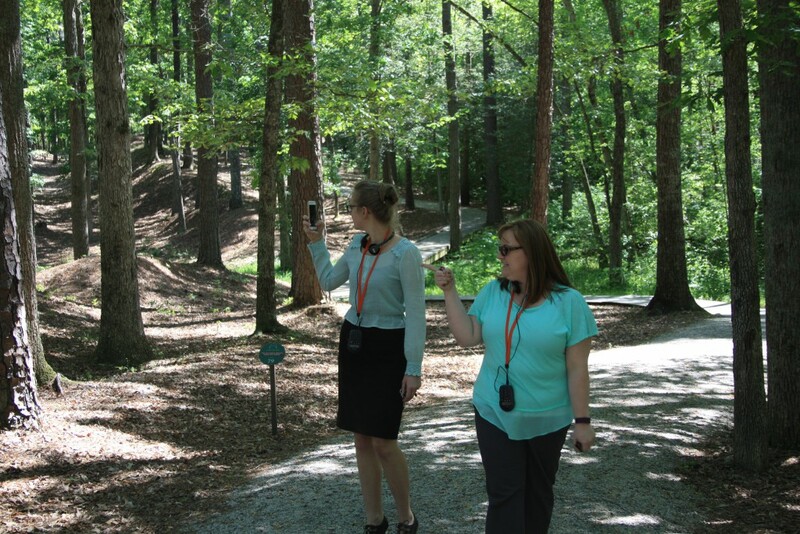 The Breakthrough Trail, one of the best battlefield walks available on any Civil War site, offers visitors a variety of options for exploring the hallowed ground where the decisive April 2, 1865 Breakthrough occurred. Three loops of varying lengths lead visitors across the avenues of attack and along some of America’s best-preserved original Civil War fortifications. The trail surface is a combination of paved aggregate and graded gravel and includes small elevation changes. Visitors will discover monuments to the 6th Maryland (US) Infantry, the Vermont Brigade, and Lane’s North Carolina Brigade at various points along the trail. The Main Loop covers about 1.25 miles and takes approximately 45 minutes of leisurely walking. This trail takes visitors to the Confederate picket line, through the valley of Arthur’s Swamp, and by two rare military dams. Hikers approach the fortifications just as the Vermont Brigade did on April 2, 1865. 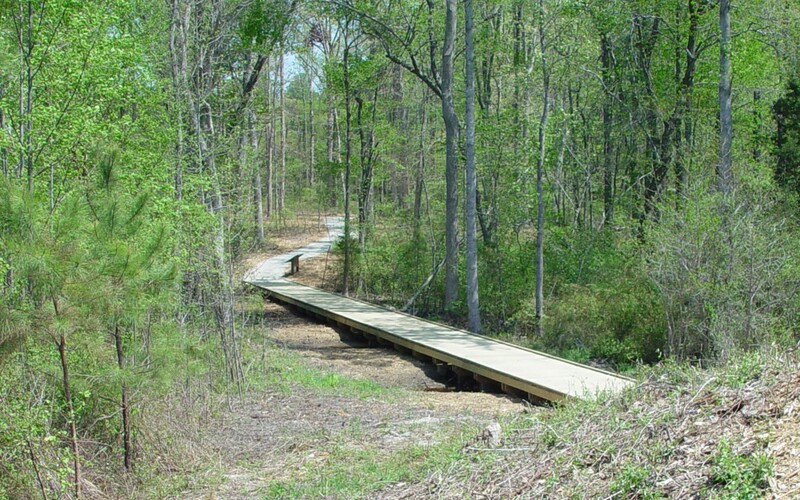 The starts of the Headwaters Trail, Woodlands Trail, and Petersburg Battlefields Trail are accessed off of the Main Loop. The Intermediate Loop is .7 miles long and takes about 30 minutes of leisurely walking. This route follows the Confederate works to a pristine original artillery redan and affords an impressive view of the battlefield. The Short Loop is .3 miles long and takes about 15 minutes of leisurely walking. It offers visitors a good look at the fortifications and returns through an original opening in the works constructed by the Confederate troops to allow their pickets to go to and from their posts. The Hart Farm Loop is .5 miles long and takes an additional 25 minutes to walk. This trail leads to the restored Hart House and exhibits discussing not only the Breakthrough, but also the fighting that occurred on the Hart Farm in October 1864. The Hart House interior is not open to the public. The Headwaters Trail begins on the Main Loop of the Breakthrough Trail. This one-mile hike follows old logging roads on a dirt surface and introduces a variety of themes pertaining to the human and natural history of the area. A brochure at the trailhead is keyed to numbered posts placed at important points along the trail. The Woodlands Trail is a 0.4 mile option along the Headwaters Trail. The Petersburg Battlefields Trail connects Pamplin Historical Park with a unit of Petersburg National Battlefield and traverses land preserved by the Civil War Trust. Trailheads are off the Headwaters Trail and near Fort Fisher on Siege Road. Visitors can begin at either end of the trail and hike it as a loop or leave a car at both ends. Please note: visitors starting at Petersburg National Battlefield must pay admission if they walk beyond the end of the Petersburg Battlefield Trailhead at Pamplin Historical Park. Each loop of the Breakthrough Trail features a series of wayside exhibits, many with audio messages that provide a complete tour of the battlefield. Use your Park Orpheo device to learn more about the Breakthrough Battlefield by referring to the numbered interpretive stops throughout the battlefield.